Shavuot (Pentecost), is a Hebrew word meaning “weeks”. 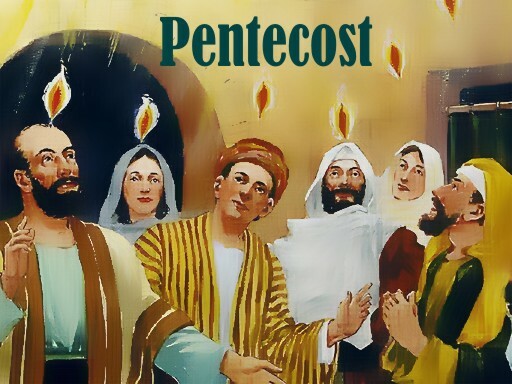 “Pentecost” is the Greek word for “50th”. After the Spring Feast of Passover/Unleavened Bread/Firstfruits you should count exactly fifty days from the last Passover and you will end up on Shavuot seven weeks later according to the Hebrew calendar. Shavuot, like so many other Jewish holidays began as an ancient agricultural festival, marking the end of the spring barley harvest and the beginning of the summer wheat harvest. All Israelite men were obligated to present themselves at the Temple in Jerusalem. 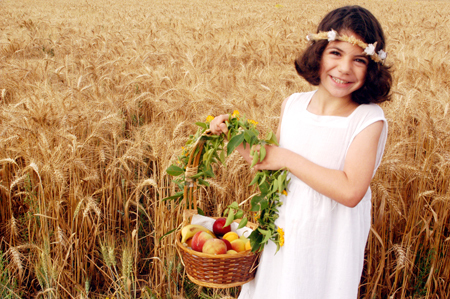 Shavuotwas distinguished in ancient times by bringing firstfruits crop offerings to the Temple, marking the beginning of the summer wheat harvest. On the day of Shavuot (usually in May or early June), the priests offered two leavened loaves of wheat bread as firstfruits to the Lord. The waving of these two loaves and sacrifice of two lambs formed a “peace offering.” The priest waved them before the altar and set them aside for the priest’s festive meal eaten in the Temple. Pilgrim worshippers were instructed to offer freewill offerings and to rejoice before the LORD. Each loaf contained about four pounds of flour (Lev. 23:17). According to Rabbinic teaching, each loaf was 7 x 4 handbreadths (28″ x 16″) and seven fingers wide (6″). 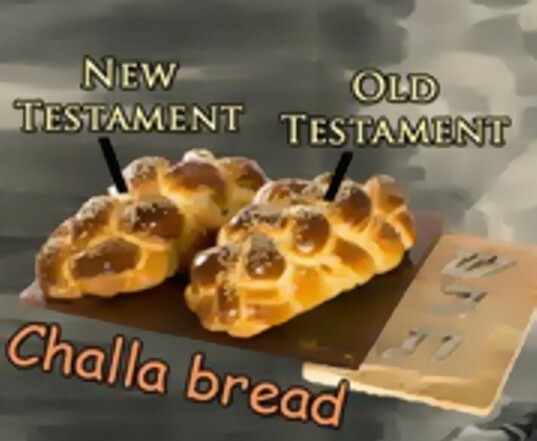 The two loaves offered on Shavuot represents the Church of Jesus Christ which is “built upon the foundation of the apostles (New Testament believers) and the prophets (Old Testament believers). But just as these loaves contain leaven (yeast), so the Christian church isn’t yet perfected (1 John 1:8). Only Jesus Christ was perfect (Hebrews 4:15). The leaven may also illustrate the presence of “Tares” (weeds) (Matt.13:38) – false brethren living among both the Old and New Testament sanctified ones. The number two in the Bible is the number of WITNESS and TESTIMONY. Two witnesses establish a truth (Deut. 19:15; Matt. 18:19-20); The Ten Commandments were written on two stones (Ex. 31:18) and are fulfilled by two commandments of love (Matt. 22:34-40). Rabbis Divert from the True Focus of Shavuot. After the Jewish temple was destroyed in 70 A.D. by the iron fist of the Roman Empire, the Jewish people were defeated and dispersed all round the world and their homeland devastated. Since the land was desolate worth nothing to harvest, the Jewish leaders (Sanhedrin) convened in A.D. 140 and decided to change the focus of Shavuot away from an agricultural festival. In order to keep the holiday alive, the rabbis invented the false doctrine (still believed to this day) that Shavuot was the day that the Torah (Mosaic law) was given to Moses on Mount Sinai. As a result, the focus of Shavuot was diverted from an agricultural feast to the commemoration of the Law and the birthday of Judaism. The Bible never associates the Feast of Shavuot with Sinai! Unfortunately, this false man-made doctrine quickly caught on and has been practiced for centuries, although it has no biblical basis. As recorded in the Bible (Acts chapter 1 and 2) that the New Testament Church was born. It was on the 50th day after the Feast of Passover/Unleavened Bread/Firstfruits that the apostles were praying together and the Holy Spirit descended on them. They received the “gift of tongues” – the ability to speak in other languages – and immediately began to preach about Jesus Christ the Messiah to Jewish people from all over the world who flocked to Jerusalem for the Feast of Shavuot. Christian Pentecost became not only a commemoration of the Holy Spirit’s visit but also marks the birth of Christianity – the uniting of both Jewish and Gentile believers in Jesus the Messiah. God Pours Out His Holy Spirit. On that morning He poured out His Holy Spirit on all flesh, as He had foretold. And that promise is still available for you today; that if you will turn from your transgression and call upon the name of the Lord, you shall be saved. Question: When is the Feast of Pentecost (Shavuot) in 2014? Note: The Jewish calendar date begins at sundown of the night beforehand. Categories: PENTECOST, The Seven Biblical Feasts | Tags: 70 A.D., Acts 2:1-4, Baptism, barley harvest, Believers, Birth of Christian Church, Church, Covenant, Feast of Pentecost, Firstfruits, God, Harvest, Hebrews 4:15, Holy Spirit, Israel, Jeremiah 31:31-33, Jesus Christ, Jewish People, Leviticus 23:15-17, Lord, Matt. 22:34-40, Matthew 7:13-14, Messiah, Mosaic law, Moses, New Testament, Peace Offering, Religion, Rome, Shavuot, spring barley, Temple, Two Loaves, Unbiblical Rabbinic Doctrines, Wave Offering, YHWH | Permalink. Tonight, May 26th at sundown begins the Feast of Pentecost. On this day almost 2,000 years ago, the first Christians gathered together in Jerusalem for a ten day prayer meeting. The apostles and disciples were filled with the Holy Spirit and began to speak in tongues and glorify God in various languages. 3,000 new believers were saved from their sins and water baptized on this day. We encourage you to read the entire 2nd chapter of the Book of Acts tonight and ask the Holy Spirit to fill you afresh with His power. In Jesus name, amen. Click Here to download our free 2011 Biblical Holiday Guide. Categories: PENTECOST, The Seven Biblical Feasts | Tags: Acts 2:1-4, Birth of Church, Birth of Israel, Exodus 19:1-6, Feast, New Testament, Old Testamen, Pentecost, Romans 11:16, Shavuot | Permalink.